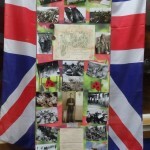 A Woking man has devoted the last few months to putting together a display to commemorate not only all those who lost their lives in the two World Wars and later conflicts, but also in memory of his Father and Son. Neville Lazenby wanted to create the display to thank Lodge Brothers Funeral Directors of Goldsworth Road, for the way they looked after his son Steven after he died of a brain tumour in January 2012. Neville and his wife Janette have remained in contact with Paul Thurtle (Branch Manager) since Paul arranged their son’s funeral. In this very special year marking the 100th anniversary of Britain entering the First World War, Neville decided to design and build a window display for the Woking Branch of Lodge Brothers. The picture shows Neville and Paul with the display. Neville has included a picture of his father, Sergeant Ralph Lazenby who died in 2003. He was an original member of the SAS in 1941. He was sent out to the Middle East, was captured and then imprisoned in Stalag 357. Also remembered in the display is Woking resident Walter ‘Charlie’ Brown OBE who died in 2010. Neville also included in the display four detailed replica figures of soldiers from his collection. The soldiers and the display have been causing a lot of interest from local people passing by the window. Paul and Lodge Brothers are extremely grateful to Neville and Janette for their generosity in using their time and talents to create a fantastic window display.